Tell me something about your 360Heros Inc? Tell me your thoughts about Virtual Reality Video Cameras? Tell me the best features of 360Heros Cameras? What to expect in the near future with respect to Virtual Reality Video Cameras? Tell me something about Video advertising and your 360Heros Inc? Tell me about Virtual Reality Video in the Global market? Upcoming Virtual Reality Video Trends in Cameras? Our mission is to empower creators through 360 video and immersive virtual reality solutions.Our goal at 360Heros is to teach people about 360 video technology and to provide the knowledge, tools and support needed to create it. Whether you’re a professional producer or an eager hobbyist, our products, services and training will help you create fully spherical and immersive 360 videos and photos. The introduction of VR video cameras has given people the ability to capture and tell stories in a far more engaging format than traditional media allows. Thanks to this technology, people are now able to experience a story rather than be told a story. This platform is revolutionising every industry from education to advertising to retail, and that’s why we’re so excited to be facilitating live action VR with our camera holder solutions. Our products are camera hardware and software solutions for creating virtual reality 360 video content. Our 360 Plug-N- Play™ Holders serve as arrays for multiple cameras that allow users to capture a full 360 x 180-degree field of view. We also provide a workflow software called 360CamMan for 360 video post-production and have a production the team that has completed 360 video projects for Disney, TIME Magazine, FOX and a plethora of other clients across the media and tech industries. Training is also a significant component of what we do as we hold monthly VR/ 360 video production workshops and do seminars on content creation across the country. Also, creating content for virtual reality head-mounted displays (HMDs) such as the Oculus Rift and Samsung Gear VR is in huge demand right now. Our products allow people to do just that as well as create videos for playback on emerging 360 video platforms such as Facebook 360 and YouTube 360. With our products, producers can take their audience into the film and create an immersive experience where the user dictates how they view the media and story. Virtual reality is here to stay. The future of VR and filmmaking wrote in the experiences people observe each time they took to a distant country, music festival, underwater (the scenarios are endless) in VR. We see VR camera technology continuing to improve regarding ease of use and system quality; two key factors we’ve been striving for in our current solutions and goals we have for future tools. We’re thrilled to be at the forefront of the emerging VR industry and to have some of the lead ad agencies and studios using our technology for client work. Examples include Firstborn’s VR experiences for Mt. Dew and Patron, Experius VR’s 360 video ads for Bentley Motors and Mercedes-Benz and a spherical automobile ad for Hyundai. These experiences offered their respective audiences an engaging, immersive experience and allowed those brands to tell their stories. Today the word virtual reality is synonymous with the word technology. Virtual reality is finding relevance in almost every industry, and that’s why we see some of the most prominent brands and content creators buying into the medium. We have been noticing a more narrative approach to VR content. As far as our company we understand the demand for VR content has increased and the industry has developed around us, we’ve continued to diversify our product line and create solutions that solve problems for spherical content creators. The most significant thing is offering people a viable workflow for creating content; from VR camera hardware to post-production software. 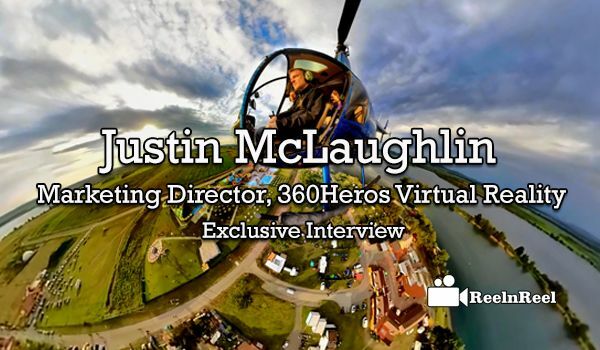 Thank you “Justin McLaughlin” for your valuable insights to our ReelnReel.com users.